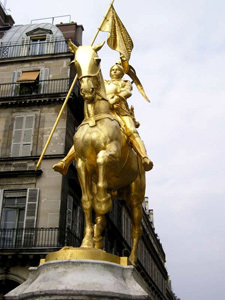 Visitors to the Louvre and the Tuileries Gardens are often surprised to stumble across a glittering gold statue of a soldier on horseback, seemingly guarding the posh Hotel Regina that overlooks the area. And many snap pics of the equestrian sculpture without ever really knowing that they’ve captured the likeness of one of France’s most celebrated heroines and a saint of the Roman Catholic Church. The statue honors teenager Jeanne d’Arc (Joan of Arc), a peasant from northeast France who became a commander in the French military and led several victories over the invading English forces during the Hundred Years’ War. Jeanne d’Arc claimed that she had received visions from the Archangel Michael, Saint Margaret and Saint Catherine directing her to battle and to help defeat the English. Jeanne d’Arc’s biggest military victory was during the Siege of Orleans in 1428-1429. England had taken the upper hand in the conflict between the countries and launched an attack on the strategic city of Orleans in an attempt to permanently quash the French forces. After six months of fighting, it appeared as though the English would take the city and ultimately all of France. But Jeanne d’Arc was sent to aid the defense of Orleans, and within nine days of her arrival the siege was turned back and the English hastily retreated. The defeat of the English at Orleans was considered the major turning point of the long war between the nations that ultimately saw the French emerge victorious. 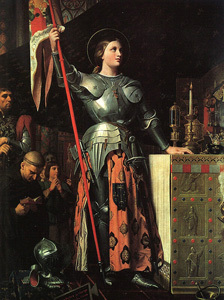 Jeanne d’Arc was captured by French forces that were allied with England in 1430. She was burned at the stake about a year later after a sham trial for heresy conducted by the traitorous Bishop Pierre Cauchon of Beauvais, France, who was little more than a puppet of the English throne. Twenty-five years after her execution, the Catholic Church reversed the sentence imposed on her and declared her an official martyr of the church as she had been unjustly killed. She was canonized by the Catholic Church in 1920. Today, Jeanne d’Arc is one of France’s nine patron saints. The statue of Jeanne d’Arc was commissioned by the French government, crafted by sculptor Emmanuel Fremiet and installed in Paris’s Place des Pyramides (the formal name of the tiny square on which the statue still stands today) in 1874. The site is significant as it is the location where Jeanne d’Arc was wounded in a failed attempt to retake Paris from English occupants, one of the teenagers few military losses. The statue was declared a French historical monument in 1992. There are several copies of the statue displayed throughout the world, including three in the United States—New Orleans, Philadelphia and Portland, Oregon. This entry was posted in Art, Beauty of Paris, Famous Paris destinations, French history, History of Paris, Right Bank and tagged Hotel Regina, Jardin des Tuileries, Jeanne d'Arc, Louvre, statues by Bob Adams. Bookmark the permalink. Actually the original is in Philadelphia–the early US was a grea tfriend of the French. paris has a copy.